If you’re anything like my husband and me, we bicker about who has to get up and turn the lights off when watching a movie or going to bed. “You were the last one to sit down, so you have to go turn off the lights,” is a common argument for why I shouldn’t have to get up. We were both thrilled when we moved into our new home and saw that the master bedroom had a remote control for the ceiling fan. Now we can both get into bed without stubbing our toes. However, we still need to solve the “movie night” dilemma, which is where these WiFi light bulbs come into play. These smart light bulbs can be controlled via smartphones, so you can turn the lights on/off or dim them. To use Philips Hue lights you must purchase the Hue Bridge, which connects up to 50 different lights, or a WiFi light switch. There are three types of lights to choose from that come in different shapes, sizes and models. You can control your lights via the Philips Hue app on any smart device. The biggest downside with Philips Hue is that the bulbs only last 15,000 hours, which is better than traditional bulbs, but others in this article last longer. However, Philips Hue wireless light bulb is less expensive than competitors and there are models that change colors, which is why we’ve chosen it as our #1 pick. Insteon offers a traditional A19 LED bulb and a larger PAR38 LED bulb for recessed lights. There are multiple ways to control your Insteon light bulbs. Insteon offers smart light switches, keypads and wireless mini remotes to turn your lights on/off, adjust brightness and set a schedule. You can also use your smartphone and the Insteon hub to control your lights and create “scenes.” Scenes are preset settings for times of the day or events. So, if you like certain lights to come on at low brightness in the morning, you can set that as your morning scene. Why isn’t Insteon our #1 pick? Philips Hue is less expensive and lets you change the color of the lighting. However, we still think Insteon is a great WiFi light bulb. 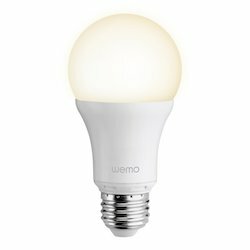 WeMo offers four WiFi light bulbs, which can help you save on your electric bill. Through the WeMo app, you can dim your lights, turn them on/off and create a schedule. These LED bulbs emit less heat and consume 81% to 83% less energy than traditional light bulbs. The life expectancy for WeMo bulbs is 25,000 hours or 50,000 hours, depending on the bulb you choose. Wink is unique in that it doesn’t offer light bulbs. Instead, Wink offers a hub that works with many different brands of light bulbs. More specifically the Quick-Start Kit includes light bulbs from GE. Other brands that work with the Wink hub include Philips Hue, Osram and Cree. You can schedule your lights to turn on/off or dim them via the smartphone app. Why didn’t Wink make our top three list? Because they don’t offer a light bulb of their own, we felt it didn’t make sense to have them in the top three. Flux is our pick for best smart light bulb with no hub required. This bulb is smartphone controlled with 16 million color options. The bulb can be scheduled to turn on and off at certain times. For example, the “Sunrise” mode turns the bulb on gradually to help you wake up. You can create other custom mode and scenes to your preferences as well. You can also sync the bulb up to your music so the color changes automatically. Incandescent bulbs are the original glass bulbs. They’re cheap, but use a lot of energy and get hot. CFLs are the coil looking bulbs that came around in the ’90s that use less heat and last longer. However, LED is the future of lighting. Not only do they last up to a decade (or more) they use significantly less energy, reducing your energy bill. It might be a small investment up front, but it will save you money over time. Check out this three-minute video from CNET that shows a quick overview of how the various types of smart lights can work in your home. There are many reasons smart bulbs make life easier. Below are a few of them. Creates less waste in our landfills because you aren’t going through bulbs as quickly. Use your smartphone as a control – no more getting up or out of bed to turn off the lights. Automation to make your home look like someone is there even when you’re away. Simplicity – no more arguing about who has to get up to turn off the lights. Save money on electric bill. You may have noticed that some of these smart bulbs require hubs. You can read all about smart home hubs in our comparison article. We chose the best and even have a handy comparison table to make it easy for you to see their respective features. Which bulbs do you use?